Jinns are having a revival, while not quite the Great Vampire Craze of the mid noughties, there’s certainly a growing body of fantasy literature dedicated to them. Drawn from ancient Arabic and Islamic mythology, their most common etymology is that they were created by God out of a smokeless fire, and said to roam the earth before the first man did. They are sort of supernatural beings, not quite human, not quite angels, and in popular mythology are said to co-exist with people. That’s the history of it, anyway, and apart from the most famous jinn I’ve ever heard of (Alladin’s Genie), there’s also Salman Rushdie’s 2015 novel Two Years Eight Months and Twenty Eight Nights, Nebula nominee The Golem and the Jinni by Helene Wecker, and from the subcontinent, Saad Z Hossain’s well reviewed Djinn City. A Firefly In The Dark by Shazaf Fatima Haider adds to this jinn-genre, the “jinre” if you will, with a classic exorcism/haunted house story for children. The story is pretty complex for the themes it delves into. Sharmeen, the young girl hero, lives in a large old house with her parents and her grandmother. Twist: the father has been in a coma for several months because of a car accident. Further twist: the grandmother is full of tales of the supernatural which she believes are completely true stories, and which Sharmeen’s mother, the sensible and unhappy Aliya forbids her daughter to listen to. There’s also a man-servant called Aziz, no, I can’t put his job title any more delicately, for man-servant he is, forever making tea and watching over the household and telling them what to do in a way that makes the grandmother rail against him for forgetting his place. “He is evil,” she keeps telling her granddaughter, and (spoiler alert) then she dies. Up until then, Aziz’s main crime seems to be too much devotion to Aliya, which the grandmother takes as him being in love with her, she’s the sort of character who lurks as background noise in many books, you know her, this old grandmother. She’s unhappy that the world is changing. She’s forever remembering the good old days when the feudal system worked so well, the class lines were ingrained in everybody and no one had to be reminded. A Firefly In The Dark struggles with its own ideas though. While very well written, the story is pulled between the age group it’s trying to talk to and these very adult themes of life and death and being alone in a strange world. Often, it makes up for this with an excess of bathos, just when the action is picking up, there’s some slapstick humour, a sort of nod and wink to the reader, there there this is going to be okay. There are other children’s books which deal with the same themes, most famously the Harry Potter series, and while those books are full of humour, you understand that at the crux of it, there is life at stake. With A Firefly In The Dark often I wished for her to have pushed the envelope a little more, there was room for it to be a truly creepy tale, and it just misses the mark. 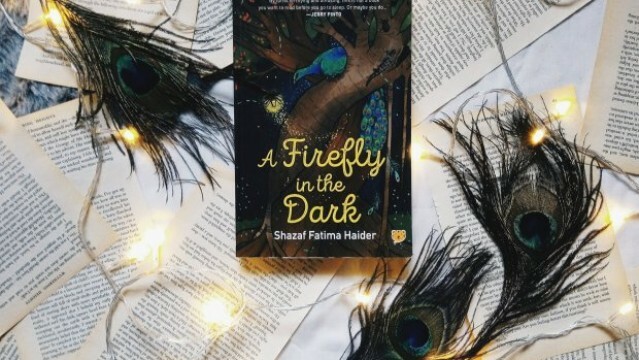 I also wish Haider had chosen to flesh out her world more, everything sort of happens at once, as soon as Sharmeen meets her own personal jinn, and the book could have benefited from being a little longer.